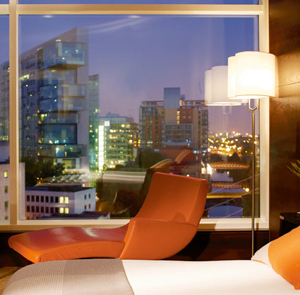 Located in Manchester’s Chapel Wharf development, on the Salford side of the River Irwell, at the foot of Santiago Calatrava’s forked Trinity bridge, the Lowry Hotel is without a doubt the queen of the Manchester hotel scene. From the outside, the building’s bowed glass face draws attention; interiors set themselves apart with a cool and crisp, almost Scandinavian look, quite at odds with the comically plush furniture and swank boudoir atmosphere that have become the hip Brit-boutique standard. Rooms look out through floor-to-ceiling windows, many over the river, and are not just smart, with sleek modern furniture and cool neutral tones, but functional as well, with broadband internet and writing desks with ergonomic chairs. And if it’s over-the-top luxury you want, you’ll find it here, whether it’s a Presidential Suite complete with a baby grand piano, or just the services of a 24-hour bath butler, on hand to draw you a bath mixed with anything from Dead Sea salts to rose petals to champagne. The Lowry boasts that it is Manchester’s first five-star hotel, and the facilities back up that claim—the health club includes a gym, six treatment rooms, and sauna and steam rooms (no pool, though). And the River Restaurant is a local favorite, serving its upscale brasserie fare to guests and non-guests alike, in a charming setting overlooking the Irwell.